Mortal Kombat 11 Old Skool vs. New Skool Trailer, showcasing a variety of past and present characters from the rich Mortal Kombat history who meet up as part of the time-bending new narrative. Through the immersive story mode, players take on the role of numerous fighters from different eras, culminating in the ultimate generational clash as current characters collide with their alternate selves. Additionally, a number of fan-favourite fighters were revealed today as the latest playable characters coming to Mortal Kombat 11, including Liu Kang, Kung Lao and Jax Briggs. Liu Kang, the greatest of the Shaolin monks, was an orphan adopted and trained in the arts of combat by the Shaolin order. He was handpicked by Raiden to be Earthrealm’s Mortal Kombat champion and chief defender. 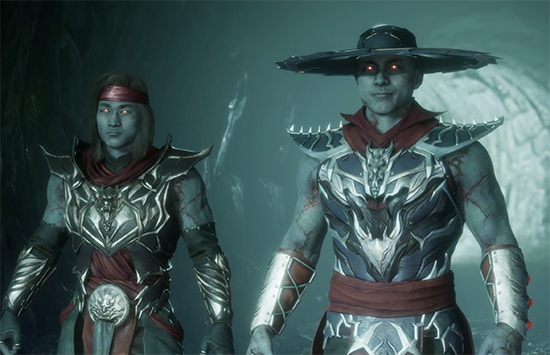 Kung Lao joined the Shaolin monks in a quest to become Earthrealm’s new Mortal Kombat champion. Reckless and rebellious, but courageous and indomitable, Kung Lao fights to prove worthy of his glorious ancestors. Major Jackson “Jax” Briggs was a decorated veteran of the Special Forces whose life changed forever when he fought in the Mortal Kombat tournament. His duty was now clear—he would defend Earthrealm against Outworld and the Netherrealm. The growing roster of confirmed playable fighters in Mortal Kombat™ 11 includes Scorpion, Raiden, Sub-Zero, Sonya Blade, Skarlet, Baraka, Geras, Kano, D'Vorah, Kabal, Jade, Johnny Cage, Cassie Cage, Erron Black, Jacqui Briggs, Kotal Kahn, Noob Saibot, Liu Kang, Kung Lao and Jax Briggs, with more exciting reveals coming in the weeks ahead. Mortal Kombat 11 is the latest instalment in the critically-acclaimed franchise, developed by award-winning NetherRealm Studios, and will be available beginning 23rd April for PlayStation 4, PlayStation 4 Pro, Xbox One, Xbox One X, Nintendo Switch and PC. Pre-order now to receive the in-game playable character, Shao Kahn. Those who pre-order on PlayStation 4, PlayStation 4 Pro, Xbox One or Xbox One X at select retailers, will also receive access to the closed beta, which will be available on from 27th March through 1st April in the UK for those platforms. Please note, a PlayStation Plus subscription or Xbox Live Gold membership is required to participate in online multiplayer matches during the closed beta. These subscriptions are not required to enjoy the Custom Character Variation System or Towers of Time content.